Are you asking yourself the right recycling questions? One of the goals of Global Recycling Day (18 March 18) is to get the world talking and thinking about recycling more – whether the focus is on the items we recycle or repurpose at home or if we decide to take a more active interest in the recycling industry and policies on our doorsteps. 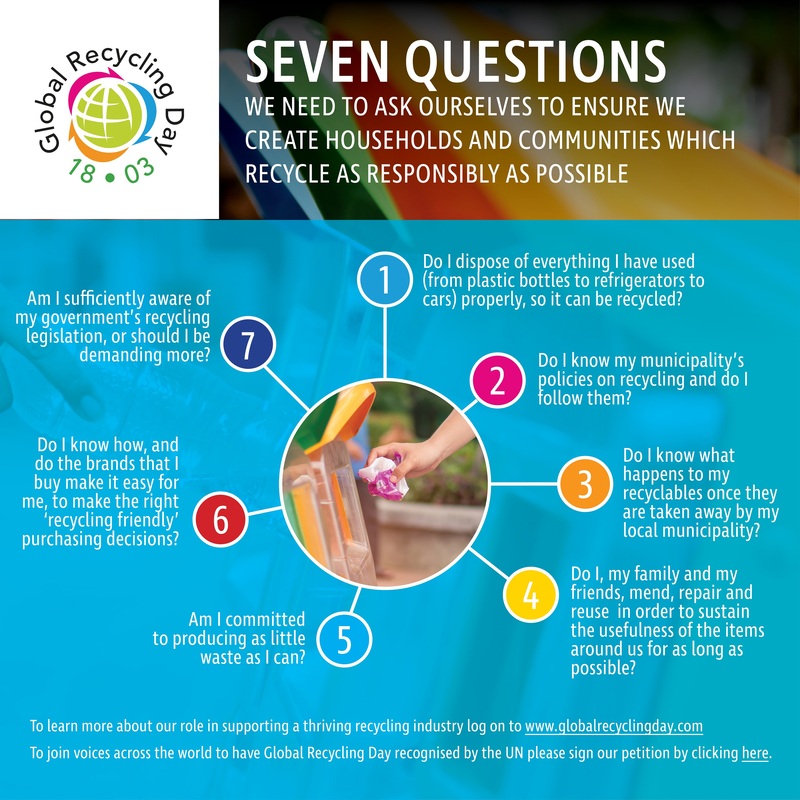 Global Recycling Day is focusing on the Seventh Resource (the seventh most important resource after the earth’s six natural ones of water, air, coal, oil, natural gas and minerals) and is asking the world to think “resource not waste” – to raise awareness we have pulled together seven questions we want everyone to ask themselves in order to be better recycling citizens. And this all starts at a very basic level. The brands we buy in the shops have a knock-on effect on how easy their packaging can be recycled. Can we change what we use for the good of the planet? Do we ensure that we really have used a product for as long as possible before we bin it? When we have finished with our possessions, from the plastic bottles we drink from to the cars we drive in, do we dispose of them in the correct way? Recycling is an issue for all of us – from the smallest individual to the most revered leaders in every far-flung corner of the globe.